The tweets come after top leaders at the conservative donor network spoke out against the direction of the GOP. President Donald Trump on Tuesday slammed the powerful Koch brothers in a series of tweets as “a total joke” who run a “highly overrated” network of donors. The tweets come just a day after the conservative network said it would distance itself from the commander-in-chief and other top Republicans who don’t support their agenda. “The globalist Koch Brothers, who have become a total joke in real Republican circles, are against Strong Borders and Powerful Trade. I never sought their support because I don’t need their money or bad ideas,” Trump tweeted. James Davis, a spokesman for the Koch network, when asked to respond to Trump's tweets, told NBC News, "We support policies that help all people improve their lives." "We look forward to working with anyone to do so," Davis said. Trump’s fierce criticism of the Koch brothers, whose network of donors have been staunch givers to Republican campaigns and causes for years, comes after top leaders at the network, spoke out against the direction of the party and vowed to be less partisan. 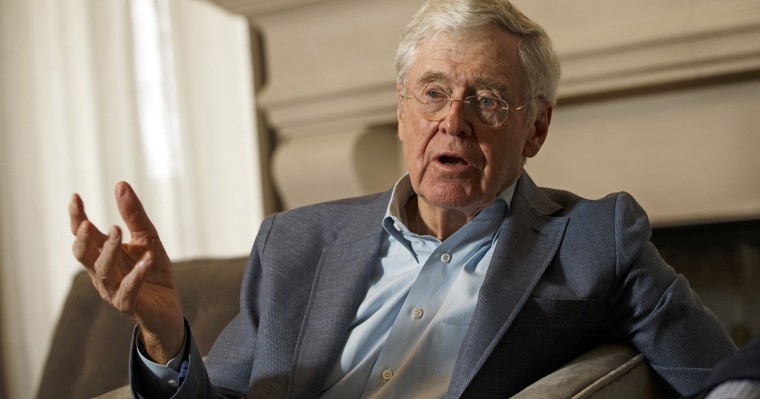 In a rare interview with reporters, Charles Koch spoke about "mistakes" he and his network have made in the past, alluding to the strictly partisan playbook that the organization has deployed for more than a decade. At a Colorado retreat for the network’s donors, Koch told reporters he "regrets" supporting some Republicans who "say they're going to be for these principles that we espoused and then they aren't." He added that the network, which spends hundreds of millions of dollars every election cycle, will be "much stricter" when determining who to support in the future. Brian Hooks, a Koch network executive, was more direct in criticizing the Trump administration. “The divisiveness of this White House is causing long-term damage,” he said, pointing specifically to Trump’s position on trade and immigration. The libertarian-leaning organization, the Seminar Network, is made up of numerous non-profits and political groups and adamantly opposes Trump’s use of tariffs to advance his trade goals. They say protectionist policies are wrong-headed and will do "long-term damage" to the economy. The group's announced distance from Trump, however, isn't entirely unsurprising: The group, which spent nearly $400 million to elect Mitt Romney in the 2012 election, sat on the sidelines in the 2016 presidential election.